Geeze, I am so lucky to have such great bloggy friends! 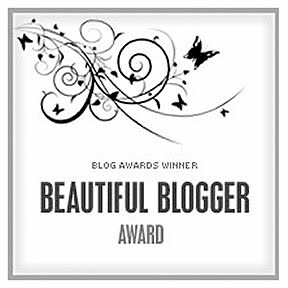 My new buddies over at the Katnip Lounge gave me the Beautiful Blogger award! 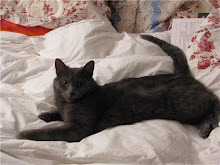 They are a newer blog, and are super cool cats! Can you believe they have their own catio?! That's a patio that was made specially for them! You guys should all go check them out, 12 kitties live there! Anyways, the rules for this award are that I tell you 7 new things about me ( or my family) and then pass the award on to 7 of my friends! Here goes! 1. Samson is part froggy. He just loves to lay with his back legs spread out behind him, in what Mommy calls the Frog position. He especially does it on the armrests of the couch. Our friend Cammy does it too, when she stayed here for a few weeks, Cammy would be on one armrest, and Sam on the other, both being froggies! Do any of you cats do that? 2. There have been little buggies inside! Samson is the best at chasing them, and eating them too! Mommy says they are his extra protein! I like them too, and so does Lexy, but we don't seem to get them as easily as Sam does, he has super powers! But then, he is also a clutz. He was chasing an itty bitty buggy, and he jumped face first into the side of the armrest on the couch MOL. 3. Mommy's sister has been talking to someone about Lexy! They are friends of Mommy's sister, and they had two very nice kittens, but the kittens had kidney disease, and both had to be put down. As sad as that is, they might be interested in Lexy! Yay! Then we could get updates about her if they adopted her! 4. Samson likes to make out with Mommy's head. Mostly if Mommy hasn't showered yet that day. He will rub all over the back of Mommy's head, and will use his claws to sort of comb her hair, and he licks her hair like crazy. It is very strange, and Mommy giggles a lot when he does that, she says its very tickley. He is just giving her a new hair do! Mommy's hair after Samson has made out with it. Isn't Samson's hair do nice? 5. Lexy loves to lay flat on her back, with all four of her feeties in the air, waving them around. I already posted a few pictures of her rug impression, but its so cute, you need to see another! Lookit that big white belly! 6. The bunnies are very happy! Since it is springtime, all the dandelions are in bloom! Mommy goes out and picks lots of the leaves and flowers for the bunnies, and after she washes them, the bunnies get to gobble them up! They eat them so fast, you barely see them move their lips! They also like clover and violets! 7. Someone is coming to visit tomorrow! They are coming to see the apartment. Mommy says she seems like a very nice person, and also loves animals, but wouldn't be bringing her cat with her. I hope she likes our home, and that Mommy and her get along, and we can get a new roommate! There is another girl interested in the apartment too, and she will probably come see it later in the week. She has a kitty named Max who would come with her. Either way, I hope we can find a nice new roommate for us! Mommy doesn't have much money right now, since she pays for everything herself now. I just realized I never mentioned that Chris and Baby left in the beginning of march. Maybe next blog post I will tell you all why. Well now you know 7 new things about us! Now we can pass it on to 7 of you! But so many people have gotten this award lately, its hard to know who has and who hasn't gotten it, so if you already have it, sorry! 1. A Cat Called Freya -She is from the UK and has a little kitten brother who just got de-nutted! 2. Dame Camdon Evercrest - My buddy! Her's is a very new blog, she needs more friends! 3. Fat Cat Bean - Butter Bean the cat, lives with 8 other cats! 4. Friends Furever - 4 kitties and two little fluffy doggies! They do lots of neat things! 5. Poppy Q - Us Gray kitties gotta stick together! Sadly I think most other kitties have already gotten this award, but if you haven't, consider it yours! Have a good Mother's Day tomorrow everyone, hug your Mommies and Beans, and Food Ladies tight! Without us they would be lost for sure! There have been Mourning Doves sitting on our balcony, and we have been watching them, and there are moths on all the window screens. There was just a Mourning Dove there! I still like my sparkly green ball the best. It was in the toy basket for the last while, and I just never took it out, and Mommy hadn't picked it out to throw for me. So when I rediscovered it when Mommy threw it for me, its love all over again! Not a good picture, I was too busy playing to pose! Mommy just missed one of me throwing it up in the air like Sam does! I wake Mommy up 3-4 times in the morning when I bring it up on the bed and ask her to throw it for me. I still bring the Tail toy up too, but my sparkly green ball is easier to get up there! I am holding my sparkle ball down so it can't escape! Can you see the bunny poops behind me? The bunnies had just been out and they forget about their litter box when they have out time. What a mess! Lexy is being SUPER lazy! She is practicing her impression of a rug. I think she is pretty good at it, but she isn't quite flat enough. What do you think? Lexy: "Is this a good rug-like pose?" Samson is busy asking for belly rubs. Yesterday, Mommy was rubbing his belly and he kept FARTING! It was STINKY too, really bad! Mommy thinks it might be cause Emily was over on friday, when the big scary loud people were here, she let Sam eat a little bit of hotdog, and later on, he ate a tiny piece of brie that had fallen on the floor. Sam will eat almost anything, but he gets smelly runny poops later. The reason Emily and Shawn were here on Friday, was because there were strange people coming in the apartment while Mommy was at work, and they made all sorts of loud noises and bad strange smells! Mommy says they were just resurfacing the bath tub, whatever that means. Mommy didn`t like having people in the apartment while she wasn`t there, so Emily and Shawn came and watched a movie while the people were there. The bath tub was all peely on the bottom, but now its all smooth, and it STINKS! Mommy won`t let us in either, so Lexy is very upset that she has to drink from a bowl, and not the tap. Look at the big mess those people made! I played a BIG trick on Emily and Shawn too! While the noisy people were here, making those nasty smells, I went and hid. Emily and Shawn had NO idea where I was, and were afraid I had somehow escaped. They looked in all the cupboards, and inside everything, and in every nook and cranny, and STILL they didn`t find me! They left for awhile, after the tub people were done and gone, and when Emily and Shawn came back, I was sitting calming waiting for them. I will never tell my hiding place! He he he. It`s a good thing you can`t smell the picture! It`s gross! Have a great lazy Sunday everyone! I hope its as nice as mine! One of the things both us kitties, and Mommy love about the apartment we live in, is the view. The building backs onto the river that runs through our city London, its called the Thames River. Mommy says that`s the same name as the big river in the London that is far away across a huge ocean! We love to sit in the door way to the balcony when the screen door is open, and listen to all the birdies and buggies! It has been really warm and humid lately, so there have been lots of noisy frogs and bugs and birds around, especially at night! Another good spot is on top of the cat tree, where we can see the trees, and if we look down, the river. We are on the 6th floor Mommy says, so right at tree level! We also sit on top of Mommy`s tall jewelery box that is on her desk, in front of the window. From there we can see down farther. Well last night, the bugs were being really noisy, and there were little moths on the screen door. Sam was batting at them, and his claw got caught in the screen, so he pulled. Imagine our surprise when the screen moved too! Sam mewed to me, and I ran over to see. I poked my paw through, and it opened even wider! The best part was that MOMMY DIDN`T SEE! Sam was scared, so I poked my head through the opening, and pushed my way through until I was on the balcony! It was really dark, and there were lots of noises and bugs flying around! I hopped up on the chairs, and sniffed the leaves and stuff. By then Samson had followed me out, and we had lots of fun for a few minutes, looking all over. Lexy must have noticed we were missing, and saw the door open, and she was just going out when Mommy happened to notice her escaping. Mommy ran over and Lexy realized we were in big trouble, and ran inside. Sam came out from under the table, and when Mommy went towards him, he ran inside. I was not so easily tempted in. I was hiding under the chairs, and since it was pitch dark, Mommy couldn`t see me. She started looking under the other chairs, but I knew she wouldn't let me stay out, so I came out of hiding, and let her herd me back in. The nice walking and biking paths behind our building. Aren`t we lucky? Mommy says she was just terrified we would jump up on the ledge to see, and fall all the way down to the ground, but we were just sniffing, I swear! We didn`t even think of going on the ledge... but now I wish I had! Sadly, Mommy will be watching us like a hawk whenever the screen door is open, but now we know that the screen doesn`t latch! We will just have to wait until she is busy again! He he he! Do any of you kitties escape outside? Or are you allowed to go outside?